Lately there has been a widespread debate and protest regarding the use of Genetically Modified Organisms (GMO) especially crops that are added as part of the ingredients towards production of organic foods and overall, this relates to the role of genetic engineering into it. Although organic foods has its own long list of benefits and importance towards our health, unscrupulous food manufacturers have decided to take the shortcut in order to maximize their earning potential, getting the fair share of sales from it organic foods products byline while at the same time lowering the production cost by applying genetic engineering towards the production process. My view on this issue is very firm whereby the practice of applying GMO is totally unacceptable no matter how economically feasible the ideas can be. Scientists and researchers especially economic planners have long frowned upon the idea of organic farming and although presented with the fact that modern day organic agriculture practice can actually solve the problem on the world’s food shortage crisis and ecological destruction, most of these people chose to ignore this simple fact but instead provide the argument that organic farming would require more land to achieve the overall same production output. While there are differing views with their own sets of evidence to backup the claim, one thing which is definitely clear will be that GMO should never be applied in organic foods production. Before we proceed further, let us understand what GMO is all about and why most people including myself are all against its use and how does it relates to organic farming. 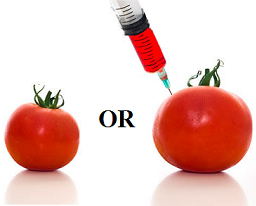 GMO basically involves altering the genes of crops and farm animals by means of artificially selecting and then extracting the genes that are needed from different organisms which determine a certain traits and characteristics and then combine it into one living matter. In order words, those traits present in the genes are intentionally selected, taken from somewhere else and then combined it by scientific techniques into the food crops and farm animals. As a result, what we have are genetically-altered far superior living beings that are specially engineered, meant to withstand drought, harsh conditions, tolerance to pests and diseases with animals that has leaner meat. While a person might argue that doing all these are fine, but by conscious mind, it is evident that we are actually playing the role of Gods and Mother Nature. Although one can argue that GE practices are for the best, but let’s take a moment to ponder these thoughts going into details. What we are actually doing are making sure that those organisms that conform to the standard of farming practices that we want, will continue to thrive but little do we realize that the variety of genes that made up all the other plants that survive until today are being neglected and are slowly destroyed. My question is, what if those traits that let’s say determine the plants with all the characteristics that we desire for but deep inside it, it may lack the nutrients for healthy living, compared to those plants which are more fragile in nature? What I intend to say over here is that we are practicing genetic engineering only up to the extent within our limit of understanding and up to the point of our current knowledge and comprehension while their potential impacts on human health and the environment have not yet been fully studied in details. What we may not realize are the effects in the long run which we may not see for now. Genetic Engineering while offers a feasible solution to grow foods faster and yet conforms to the standard of organic practices, it will still defeat the whole purpose of health and environmental friendly approach that we have discussed earlier in other topics. The main thing is that if we want to go organic and live by its true principle and value, then by all means we must stick to the original purposes and definitely for sure, use of genetic engineering in organic agriculture is out of question here. I hope I have made my points clear. Have your own ideas and views to voice up? Share your thoughts by leaving comments. Not sure whether to go organics? These 3 reasons will tell you why you should go ahead with your plan.